Strategic planning is a process owners use to make their company better. It is a tool managers use to analyze their current landscape and identify future goals for potential leveraging. 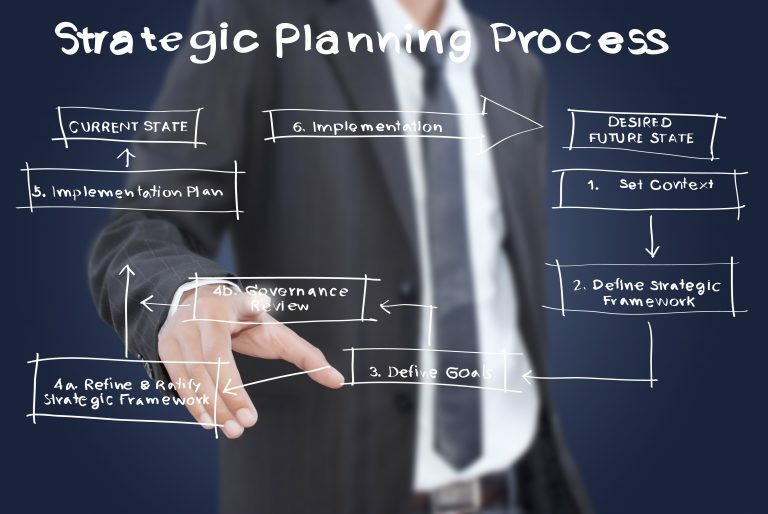 There are several steps involved in strategic planning. Here are five steps for success in making strategic planning work for your small business. Before you learn about the steps involved in strategic planning, it is good to have a more in-depth knowledge of what exactly it is. Strategic planning, more specifically, is a part of organizational management. It is used to focus energy and resources, strengthen operations, establish agreement regarding goals for all stakeholders, and assess and adjust organizational direction in reaction to environmental changes. Strategic planning involves fundamental decision-making and actions that help to shape an organization. These practices also help make a business better able to measure success and results. Now that you know a bit more about what strategic planning is, you will better understand what it entails. This is an important first step. Before you can think about where you want your company to go, you must analyze where you are now. Identify your organization’s strengths and weaknesses. You also need to look at the market and your contribution margin. Think about the challenges and opportunities within your industry. This can be a difficult process because it requires an objective view of your business. However, it is the most important step because you cannot move forward until you know where you are. Make sure your first step in strategic planning is to analyze where you are now. The next step in strategic planning is to think about where you want your business to be in the future. Think about your business in a broad sense. Decide what sort of legacy you wish to leave behind. You may want to be known as the best at what you do. Perhaps you want to have the largest customer base in your industry. Use the strengths and weaknesses you discovered in step one to create a general idea of what you want your business to achieve. Defining where you want your company to be in the future is a vital part of strategic planning. Now that you have analyzed where you are and where you want to go, it is time to set goals. Use the broad idea you generated in step two to narrow your focus. Set specific goals that relate to that focus. For example, if you decided you want to have the most customers in your industry, set a goal to increase your customer base by a specific amount in a certain time period. Communicate these goals to your team. Make sure they are clear and understood by all. Be sure to set specific goals in the third stage of your strategic planning, just as you would set specific qualifications when searching for telecom carriers. Once you have set goals, you must create a structure of accountability. Determine who is responsible for each goal. Make sure the goal is relatable to the person accountable. Your sales team can be in charge of growing the customer base. Research and development will be in charge of improving your product and conducting customer research. You will only achieve these specific goals by assigning them to the appropriate team. Remember that creating a relevant structure of accountability is an important step in strategic planning. The final stage in strategic planning is to review and evaluate your process. You must do this frequently. Be open to unfavorable results. Remember the specific goals you set in step three and determine if the responsible parties have achieved those goals. If not, examine where the issues occur. You may need to adjust the goal. You might have to assign it to a new team. Plan to review your strategic plan on a quarterly basis, at a minimum. This gives you ample time to see if the process is working. However, it is not so long that it cannot be adjusted along the way. Remember this important final stage in strategic planning. Strategic planning is a management tool that business owners use to improve their business. It requires close examination of where the company is and where you wish to go. Specific goals should be set and they should be assigned to the appropriate teams. Finally, a system should be in place to evaluate the plan’s effectiveness and adjust accordingly. When you are ready to plan for the future, remember this post and follow these steps in strategic planning.